It is amazing how so many persons are falsely too quick to justify their own wrong doings..
“James 4 1From whence come wars and fightings among you? come they not hence, even of your lusts that war in your members? 2Ye lust, and have not: ye kill, and desire to have, and cannot obtain: ye fight and war, yet ye have not, because ye ask not. 3Ye ask, and receive not, because ye ask amiss, that ye may consume it upon your lusts. 4Ye adulterers and adulteresses, know ye not that the friendship of the world is enmity with God? whosoever therefore will be a friend of the world is the enemy of God. 5Do ye think that the scripture saith in vain, The spirit that dwelleth in us lusteth to envy? 6But he giveth more grace. Wherefore he saith, God resisteth the proud, but giveth grace unto the humble. 7Submit yourselves therefore to God. Resist the devil, and he will flee from you. 8Draw nigh to God, and he will draw nigh to you. Cleanse your hands, ye sinners; and purify your hearts, ye double minded. 9Be afflicted, and mourn, and weep: let your laughter be turned to mourning, and your joy to heaviness. 10Humble yourselves in the sight of the Lord, and he shall lift you up. There are still too many persons who equate book or head knowledge with real spirituality but nothing can be further from the truth since most of what these people do know is still only partial truths, mixed with loads of falsehoods, and they also do not have any real practical relationship, experience walking with God so it all mostly does not count, merely inflates their egos..
Tell me who your friends are and I can tell you what you are like, a man is known by the company he keeps. Bible ignorant persons do not know that there are plenty of verses even in Proverbs too that deal with us not having bad associates but for us rather to rebuke them too.. Wicked people are wicked and they even take false pride in corrupting others.. And the contrast between the ungodly and the godly. The ungodly are mocking, speaking great swelling words, and walking after their ungodly lusts, while the righteous are building up themselves in their most holy faith, and keeping themselves in the love of God. ..parrot like persons repeat what they hear others tell them or what they hear the devil telll them whereas a Godly persons will quote the Bible and what God the Holy Spirit isntructs them to say.. of Course the holy Spirit has departed from all ungodly wicked persons.. As far as light is removed from darkness, and life from death, so far does a believer differ from the ungodly. “To the law and to the testimony: if they speak not according to this word, it is because there is no light in them…. And they shall look unto the earth; and behold trouble and darkness, dimness of anguish; and they shall be driven to darkness” (Isaiah 8:20, 22). Apostle Paul said in his letter to the Ephesians. He was warning them not to walk as some do “in the vanity [pride] of their mind” (Ephesians 4:18). He warned of those who learned Christ in a perverted way, because their understanding was darkened. They were “cut off from the life of God through the ignorance that is in them, because of the blindness of their heart” (Ephesians 4:18). Paul said of them, they “are past feeling and have given themselves over unto lasciviousness [lustfulness], to work all uncleanness with greediness” (Ephesians 4:19). They are deceived, and consequently they are deceivers themselves for they have mislearned the true Christ! so “…they shall be driven to darkness…” (Isaiah 8:22). Isaiah warned, “…their root shall be as rottenness,…because they have cast away the law of the Lord of hosts, and despised the word of the Holy One of Israel. Therefore is the anger of the Lord kindled against his people…” (Isaiah 5:24, 25). Of course the devil wants you to have wicked friends so they can corrupt you. I think one would would want to to avoid wicked people.. especialy if you are yourself still wicked? For the sinful kingdom of self is actually inspired by the devil himself.. and when you present a truth the devil will always try to send one of demonic followers to try to deny it “.Lest Satan should get an advantage of us: for we are not ignorant of his devices.” As to the wicked, bad people I can love them but I can still freely choose who my real friends are.. if you fellowship with the wicked still it is cause you are going to hell still.. as clearly you have not make a full seperation to God, and Jesus Christ is not the Lord of your life, so of course for sure you are still undeniably hell bound.. if you cannot give up bad friends for jesus Christ you realy are not a born aagain, holy Spirit filled Christian.. you do have to still to trust and obey God in all things to still next make it to Heaven.. If your a saint, and you are a follower of Jesus Christ, don’t avoid to preach to them, but avoid hanging around with them.God has demanded that we all do ask all men to repent, world wide too..
Eph 5:11 And have no fellowship with the unfruitful works of darkness, but rather reprove them. 12 For it is a shame even to speak of those things which are done of them in secret. 13 But all things that are reproved are made manifest by the light: for whatsoever doth make manifest is light. Prov 1:10 My son, if sinners entice thee, consent thou not. 11 If they say, Come with us, let us lay wait for blood, let us lurk privily for the innocent without cause: 12 Let us swallow them up alive as the grave; and whole, as those that go down into the pit: 13 We shall find all precious substance, we shall fill our houses with spoil: 14 Cast in thy lot among us; let us all have one 16 For their feet run to evil, and make haste to shed blood. 17 Surely in vain the net is spread in the sight of any bird. 18 And they lay wait for their own blood; they lurk privily for their own lives. 19 So are the ways of every one that is greedy of gain; which taketh away the life of the owners thereof. “Let no man [even preachers] deceive you with vain [empty] words: for because of these things cometh the wrath of God upon the children of disobedience. 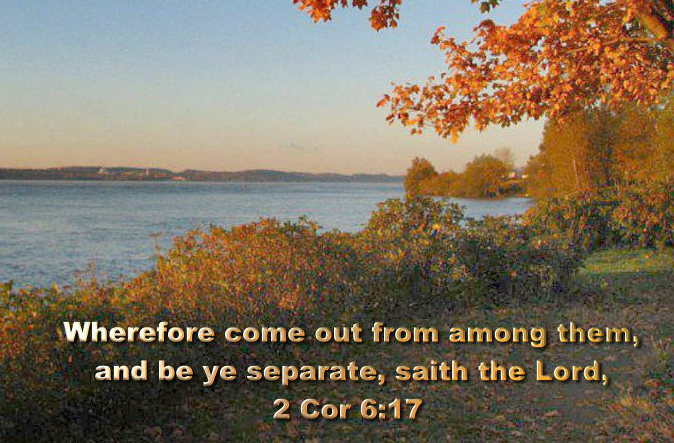 Be ye not therefore partakers with them” (Ephesians 5:6, 7). God commands all men everywhere to repent Acts 17,30. 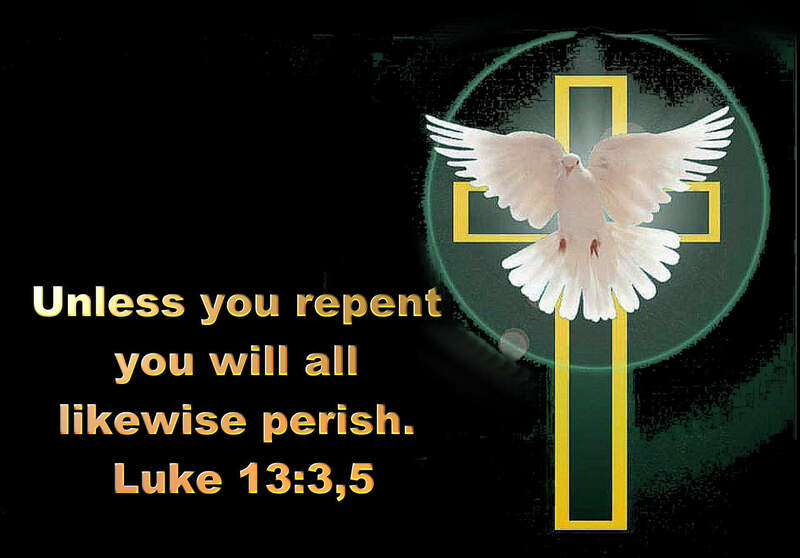 Unless they repent, they will likewise perish Luke 13,3. Now don’t take me wrong for what I am about to say. I am not defending Satan. He is a liar and a deceiver. But what I am saying is this— sometimes we are deceived and it is not Satan who deceives us. First Corinthians 3:18 says, “Let no one deceive himself.” A nd in 1 John 1:8 it says, “If we say that we have no sin, we deceive ourselves, and the truth is not in us.” We can see clearly from these two verses that it is possible to deceive ourselves. How do we deceive ourselves anyway? Once again let’s go to the Word. According to the Bible, then, a man who hears the Word and does not do it deceives himself. Because he hears the Word of God, he has convinced himself that everything is okay. The reality, however, is that everything is not okay. He just thinks it is. Therefore, he has deceived himself. In Matthew 7:24–27, Jesus tells the story of two men who built houses. One man, a wise man, built his house on the rock and when the storms came, his house withstood the storms. The other man, a foolish man, built his house on the sand. When the storms came, his house was destroyed. Jesus said the man who built his house on the rock was like someone who hears His sayings and does them. He compared the foolish man who built his house on the sand to a man who hears His sayings and does not do them. Both men built houses and probably both houses looked good. Both men heard the sayings of Jesus and that’s good. But when the storms came, only the house that was built on the rock, only the man who acted on what he heard, survived. Acting on the Word of God is what we call faith. So, we have a choice to make. Do we hear the Word and sit back and say, “That sounds pretty good” and do nothing? Or, do we hear the Word and then act on what we hear? A doer of the Word is someone who prays for the sick. A doer of the Word is someone who forgives. A doer of the Word is someone who loves those who don’t love in return. A doer of the Word is someone who casts out demons. A doer of the Word is someone who is not self- deceived. Because of pride, Satan rebelled against God. When pride enters into the heart of a man, he is a candidate for self-deception. Obadiah 1:3 says, “The pride of your heart has deceived you.” According to the Word, we have been warned against self-deception. The following are eight basic ways we deceive ourselves. If anyone thinks himself to be something, when he is nothing, he deceives himself. Let him who is taught the word share in all good things with him who teaches. Do not be deceived, God is not mocked; for whatever a man sows, that he will also reap. For he who sows to his flesh will of the flesh reap corruption, but he who sows to the Spirit will of the Spirit reap everlasting life. Adam was not deceived, but the woman being deceived, fell into transgression. The bottom line to avoiding self-deception or deception by someone else is this: God’s Word is true. If we walk in the truth of His Word instead of the opinions of worldly people, we will not be deceived. Posted on September 30, 2012 September 30, 2012 Categories Christianity, Religious discussions ChristianityTags Bible, Christian, Deacons, elders, god, Holy Spirit, Jesus, Jesus Christ, New Testament, pastorsLeave a comment on It is amazing how so many persons are falsely too quick to justify their own wrong doings..
Mat 15:8 This people draweth nigh unto me with their mouth, and honoureth me with their lips; but their heart is far from me. 9 But in vain they do worship me, teaching for doctrines the commandments of men. Many even professing Christian persons are falsely still relying on isolated verses out of thousands to support their imaginary eternal forgiveness, salvation, to the false exclusions of the rest of the Bible. ◦For the message of the cross is foolishness to those who are perishing; but to us who are being saved the cross is the power of God. 1 Cor 1:18. ◦We desire that every one of you show the same diligence in realizing the full assurance of hope to the end. 1 Sam 15:22 And Samuel said, Hath the LORD as great delight in burnt offerings and sacrifices, as in obeying the voice of the LORD? Behold, to obey is better than sacrifice, and to hearken than the fat of rams. 23 For rebellion is as the sin of witchcraft, and stubbornness is as iniquity and idolatry. Because thou hast rejected the word of the LORD, he hath also rejected thee from being king. Like the Pharisees, too many of today’s ministers like to walk about in long robes and love to be greeted [with honor] in places where people congregate and love the best seats in the synagogues and places of honor at feasts. Like the Pharisees, too many today’s ministers outwardly seem to people to be just and upright but inside they are full of pretense and lawlessness and iniquity [sin], and grasping self-indulgence. They feed themselves while fleecing the sheep; and they are greedy dogs who can never have enough; they are shepherds who cannot understand; they all look to their own way, every one for his gain, from his quarter. They come to you in sheep’s clothing, but inwardly they are ravenous wolves. Micah 3:5 Thus saith the LORD concerning the prophets that make my people err, that bite with their teeth, and cry, Peace; and he that putteth not into their mouths, they even prepare war against him. Micah 3:6 Therefore night shall be unto you, that ye shall not have a vision; and it shall be dark unto you, that ye shall not divine; and the sun shall go down over the prophets, and the day shall be dark over them. Micah 3:7 Then shall the seers be ashamed, and the diviners…confounded: yea, they shall all cover their lips; for there is no answer of God. Micah 3:8 But truly I am full of power by the spirit of the LORD, and of judgment, and of might, to declare unto Jacob his transgression, and to Israel his sin. Micah 3:9 Hear this, I pray you, ye heads of the house of Jacob, and princes of the house of Israel, that abhor judgment, and pervert all equity. Micah 3:10 They build up Zion with blood, and Jerusalem with iniquity. Micah 3:11 The heads thereof judge for reward, and the priests thereof teach for hire, and the prophets thereof divine for money: yet will they lean upon the LORD, and say, Is not the LORD among us? none evil can come upon us. Micah 3:12 Therefore shall Zion for your sake be plowed as a field, and Jerusalem shall become heaps, and the mountain of the house as the high places of the forest. Micah 4:1 But in the last days it shall come to pass, that the mountain of the house of the LORD shall be established in the top of the mountains, and it shall be exalted above the hills; and people shall flow unto it. Micah 4:2 And many nations shall come, and say, Come, and let us go up to the mountain of the LORD, and to the house of the God of Jacob; and he will teach us of his ways, and we will walk in his paths: for the law shall go forth of Zion, and the word of the LORD from Jerusalem. Micah 4:3 And he shall judge among many people, and rebuke strong nations afar off; and they shall beat their swords into plowshares, and their spears into pruninghooks: nation shall not lift up a sword against nation, neither shall they learn war any more. Micah 4:4 But they shall sit every man under his vine and under his fig tree; and none shall make them afraid: for the mouth of the LORD of hosts hath spoken it. Micah 4:5 For all people will walk every one in the name of his god, and we will walk in the name of the LORD our God for ever and ever..
Jer 15:18 Why is my pain perpetual, and my wound incurable, which refuseth to be healed? wilt thou be altogether unto me as a liar, and as waters that fail? 19 Therefore thus saith the LORD, If thou return, then will I bring thee again, and thou shalt stand before me: and if thou take forth the precious from the vile, thou shalt be as my mouth: let them return unto thee; but return not thou unto them. 20 And I will make thee unto this people a fenced brazen wall: and they shall fight against thee, but they shall not prevail against thee: for I am with thee to save thee and to deliver thee, saith the LORD. Gal 2:19 For I through the law am dead to the law, that I might live unto God. Gal 2:20 I am crucified with Christ: nevertheless I live; yet not I, but Christ liveth in me: and the life which I now live in the flesh I live by the faith of the Son of God, who loved me, and gave himself for me. Gal 2:21 I do not frustrate the grace of God: for if righteousness come by the law, then Christ is dead in vain. Gal 3:1 O foolish Galatians, who hath bewitched you, that ye should not obey the truth, before whose eyes Jesus Christ hath been evidently set forth, crucified among you? Gal 3:2 This only would I learn of you, Received ye the Spirit by the works of the law, or by the hearing of faith? Gal 3:3 Are ye so foolish? having begun in the Spirit, are ye now made perfect by the flesh? Gal 3:4 Have ye suffered so many things in vain? if it be yet in vain. Gal 3:5 He therefore that ministereth to you the Spirit, and worketh miracles among you, doeth he it by the works of the law, or by the hearing of faith? Gal 3:6 Even as Abraham believed God, and it was accounted to him for righteousness. No one realy likes to have computer problems and no one likes crooked salesman as well, at least they rightfully should not..